Joshua Tree was initially created as a National Monument in 1936, containing 825,000 acres. It was elevated to a National Park in 1994 by the Desert Protection Act, which also added 234,000 acres to the park. The park is named after Joshua trees (not really trees but Yucca) that are native and grow in the park. One of the more popular explanations for the plants being named Joshua Trees follows: “The name Joshua tree was given by a group of Mormon settlers who crossed the Mojave Desert in the mid-19th century. The tree’s unique shape reminded them of a Biblical story in which Joshua reaches his hands up to the sky in prayer.” There are other less popular explanations, but I’m stickin’ to this one since I saw it on a placard in the park. The park is composed of two different and distinct deserts, the Mojave and the Colorado. The Mojave desert is higher and cooler. This is where the Joshua trees grow. Driving through this part of the park you’ll see widely spaced Joshua trees and dense Joshua tree forests. The western part of the Mojave section of the park is dominated by hills of bare rock broken up into large boulders. You will see rock climbers doing, in my opinion, crazy stuff up and down the faces of the largest rock outcroppings. The Colorado desert is lower, below 3,000 feet, and covers the eastern part of the park. This part of the park looks like what most people imagine when talking about desert. It’s a more wide-open, flat landscape full of Creosote, Ocotillo, Yucca and Cholla cactus … lots of Cholla cactus. A side note about Joshua trees: It’s hard to tell how old they are because they don’t have growth rings like you would find in an oak or pine. They are almost hollow in the middle and are made up of tiny fibers inside. You can make a rough estimate based on height since Joshua trees grow one-half inch to three inches per year. Researchers think an average lifespan for a Joshua tree is about 150 years, but some of the larger ones could older than that. We stayed in the Black Rock Campground, in the northwest corner of the park, for three nights. Since we have a National Park Adventure Pass, it only cost us $10 a night instead of the usual $20. There are no hookups, so you need to be self-sustained, but there is a dump station. The views were beautiful from our campsite, #97, but the roads in the campground are awful with broken asphalt, deep potholes and ruts. We have a 28’ trailer and know how to maneuver it in tight spaces, but we could not go down some of the roads and we could not make some of the sharp turns. Good luck in some parts of this campground if your rig is over 28’. The facilities are clean and the rangers/camp hosts are very friendly and helpful. We’d stay there again since we now know how to navigate the campground and what parts to avoid while towing. If you visit, it’s best to go Sunday through Thursday since weekends are booked solid most of the time. We’re retired, so that works just fine for us. Day 1: Joshua Tree Visitor Center, Quail Springs, Hidden Valley, Keys View, Cap Rock, Jumbo Rocks and Skull Rock. All of these stops were in the Mojave Desert area of the park. We stopped at the Visitor Center to pick up boxed lunches, which you can order at the Joshua Tree Park Rock Cafe. These are perfect for a day of adventure in the park. Once in the park, there are no restaurants or facilities of any kind to speak of, so either make your own lunch or get one at the cafe at the Visitor Center, which we highly recommend. They were very good and reasonably priced. Driving down Park Boulevard, the main road in the park, our first adventure stop was at Quail Springs. The main attraction there is the large rock formations which are a favorite of rock climbers. The west face of Quail Springs is one of the most popular and visited faces in all of Joshua Tree National Park. Most any day you will find rock climbing classes being held on the west face. We saw climbing classes scrambling up the rocks. There was also a lot of filming taking place, so I’m guessing that is part of the deal when folks sign up for a class, so they can prove to friends and relatives that they really did it. Our next stop was Hidden Valley. Hidden Valley is just what the name implies, a valley surrounded by massive boulders. You can’t see the valley from the road or parking lot, you have to hike into it (it’s a short, easy hike). Once in the valley, a one-mile loop trail guides you around the interior of the valley. Supposedly, this valley was used by cattle and horse rustlers to hide, graze and rebrand stolen cattle and horses. Rock climbers like Hidden Valley as there are massive rock faces to challenge their skills. We saw rock climbers on top of some crazy high rocks. We ate our yummy box lunches at one of the many picnic tables just outside of the valley. Next, we went to Keys View. This place is 5,185 feet up and features a breath taking view of the Coachella Valley and Mount San Jacinto. On a clear day, if you look real hard, supposedly you can see the San Andreas Fault running through the valley below. We didn’t see the fault because of weather conditions, but the view was stunning for sure. The video above shows what we saw. Pardon the sound, it was a very windy day. Cap Rock was a stop driving back down the road from Keys View. This area features more huge rocks for climbers, Joshua Trees and other desert plants. The place got its name because of this huge flattish boulder that looks like the brim of a cap balancing on top of a gigantic rock next to the parking lot. We hiked a .4 mile loop trail around the area. The scenery is beautiful and the rocks don’t look real, they look like the man-made concrete rocks you see at Disneyland or Knott’s Berry Farm. The last two stops of the day were Jumbo Rocks and Skull Rock. Jumbo Rocks is another famous rock climbing site and a favored campground. The campground is scattered around huge rocks and is quite appealing, however, it looked to us like it was only suitable for tents or small RV’s/travel trailers. I wouldn’t want to try and maneuver our 28’ trailer through this campground. Skull rock is about .5 miles down the road from Jumbo Rocks and … it looks like a skull. This is another great hiking area. Everywhere you go, there are large, interesting rock formations and desert plants. It was very, very windy in the park this day, so we were unable to use our grill to cook dinner outside. We like to BBQ outside as much as we can because, for some reason, the food always seems to taste better and it keeps the trailer cleaner inside. It was also cold, by California standards, so we were glad we had a heater in the trailer. With the wind and cold, we felt a little sorry for the tent campers in the campground, but forgot about them after a few glasses of wine, at least I did. Day 2: Joshua Tree Visitor Center, White Tank, Cholla Cactus Garden, Ocotillo Patch, Cottonwood Spring Visitor Center and Barker Dam. The Visitor Center, White Tank and Barker Dam are in the Mojave Desert portion of the park, while the Cholla Cactus Garden, Ocotillo Patch and Cottonwood Visitor Center are in the Colorado Desert part of the park. We covered a lot of ground on day 2, spanning the entire park from north to south. Joshua Tree is a huge park and it takes a lot of time driving to get from place to place. Also, there are all kinds of little roadside points of interest, designated by small road signs, to stop and look at along the main roadway. Be ready to drive and drive. We started our day by picking up boxed lunches, again, at the Joshua Tree Visitor Center. White Tank was our first stop. 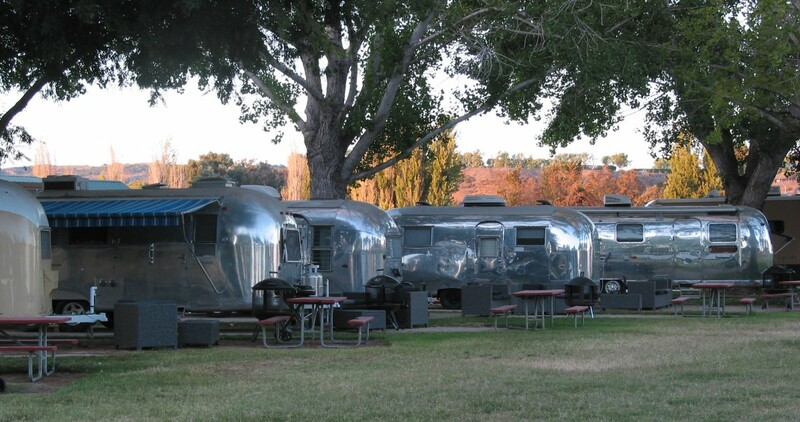 It’s a small campground, 15 campsites, that is very, very nice for tents and small trailers/RV’s. Ours won’t fit so we won’t be staying here although we wish we could. The campsites are nestled amongst large rock formations making most campsites very private. We stopped here to take a .3 mile hike to Arch Rock. The arch is made of granite and spans about 35 feet. The inside height of the arch is about 15 feet. We also did some general scrambling around the rocks and boulders. It’s hard to describe areas like this. The rocks are amazing and almost make you feel like you are on a different planet. The Cholla Cactus Garden and Ocotillo Patch are both in the Colorado desert, Pinto Basin portion of the park. There are no Joshua Trees here. There is a trail, a short trail, that winds through a wide, natural expanse of cholla cactus called the Cholla Cactus Garden. Cholla cactus look so fuzzy and cute but I don’t think you want to touch one. They are actually nasty little buggers with very sharp quills that will latch onto your shoes, pants or whatever if you get too close. Don’t wear shorts or open sandals when visiting here but do stop and take a look if you are in the area. About one mile south is the Ocotillo Patch. Ocotillo are tall and spindly plants that are one of the signature plants of the Colorado Desert. When there is no moisture, they look dead and dried out, but they aren’t. When it rains, Ocotillo sprout tiny leaves and orange-red flowers above each sticker and can grow up to 12 feet high. Our next stop was the Cottonwood Spring Visitor Center located in the south end of the park. Besides a visitor center, there are several trailheads and a campground. We didn’t have time to do much exploring here, but we did take time to eat our boxed lunches (it was about 3pm so I guess it wasn’t really lunchtime anymore). After lunch, we drove to Barker Dam, in the Mojave Desert, which was on our way back to our campground. This is an interesting place and worth hiking the 1.1 mile loop trail to see. A guy named Bill Keys built a dam here around 1900 to hold water for cattle and for mining use. When it rains, like it did just before we visited, a lake forms behind the dam. When this happens, shorebirds are sometimes attracted and can be seen wading through the water, which is something to see in the middle of the Mojave Desert. Further down the trail is a overhanging boulder that has native petroglyphs on it. Unfortunately, they were painted over, “enhanced”, by a Hollywood film crew in the 1960’s so they don’t look authentic. It’s not sure if the petroglyphs were done by Serrano or Chemehuevi Indian tribes. We saw what may or may not have been some other petroglyphs in between some rocks farther down the trail. These could have just been graffiti, we couldn’t tell. Graffiti is a real problem in the park, some areas have been closed to the public as a result, and visitors are encouraged to report it. The last part of this hike is through an area filled with Joshua Trees. This is a good place to get a up-close look at one and get “artsy” with your camera like I did. This was our first trip for 2017 and it was great. Joshua Tree National Park is a must see for anyone visiting the Southern California area. We are in the process of planning our camping this year and should have most everything finalized by the end of February, so keep checking back, or better yet, follow our blog and get email notifications when we make new blog entries. Here are some soothing sunsets to end this blog entry … enjoy! We hope to see you on the road sometime! I think it’s time for you to start writing a book. Really enjoyed! Next Next post: Baby’s Got New Shoes!